The Spending Power of Congress. The Issues: How far does the power of Congress to spend tax dollars extend? The powers of Congress are enumerated in several places in the Constitution. The most important listing of congressional powers appears in Article I, Section 8 (see left) which identifies in seventeen paragraphs many important powers of Congress. In this section, we consider how the federal government's power to spend tax dollars has been interpreted by the Supreme Court.. In the 1987 case of South Dakota vs Dole, the Supreme Court considered a federal law that required the Secretary of Transportation to withhold 5% of a state's federal highway dollars if the state allowed persons less than 21 years of age to purchase alcoholic beverages. South Dakota, which allowed 18-year-olds to drink and stood to lose federal funds for highway construction, sued Secretary Dole, arguing that the law was not a constitutional exercise of the power of Congress to spend--but rather was an attempt to enact a national drinking age. In upholding the federal law, the Court announced a four-part test for evaluating the constitutionality of conditions attached to federal spending programs: (1) the spending power must be exercised in pursuit of the general welfare, (2) grant conditions must be clearly stated, (3) the conditions must be related to a federal interest in the national program or project, and (4) the spending power cannot be used to induce states to do things that would themselves be unconstitutional. The Court considered--perhaps unrealistically--the grant condition to be a financial "inducement" for South Dakota to enact a higher drinking age rather than financial "compulsion" to do so--suggesting the possibility of a different result if a higher percentage of funds had been withheld. In dissent, Justice O'Connor argued that spending conditions should be found constitutional only if they related to how the federal grant dollars were to be spent. cannot be denied federal funds for their more limited, existing, programs. 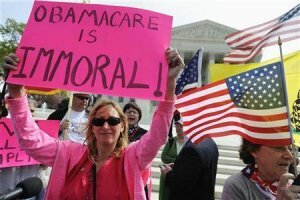 In 2012, the Court considered whether provisions of the Affordable Care Act, which withheld federal funds from states that failed to expand Medicaid coverage in specified ways, was within the power of Congress under the Spending Clause. In National Federation of Independent Business v Sebelius, the Court held that it was unconstitutional to threaten states with the withholding of all federal Medicaid funding, including their existing funding, for failing to expand coverage in the ways Congress sought to encourage. Chief Justice Roberts, in a part of his opinion joined by Justices Breyer and Kagan, concluded that federal funds withheld, representing perhaps 10% of a state's entire budget, was so substantial that states would have no real choice but to give into Congress's demands. As a result, seven justices agreed that the Affordable Care Act's Medicaid expansion provisions violated the principle that the spending power can not be used to coerce states into enacting legislation or participating in a federal program. The Court distinguished South Dakota v Dole, noting that the funds potentially lost by South Dakota in that case representing only one-half a percent of the state's budget. 1. In South Dakota vs Dole, is it clear that South Dakota's lower drinking age jeopardized federal interests in the national highway program? If so, how substantially? 2. Could Congress condition the receiving of federal dollars to fight crime on a state's having enacted the death penalty? How--if at all--would such a condition differ from the condition upheld in South Dakota vs Dole? 3. What result in South Dakota vs Dole if South Dakota stood to lose all federal highway money if it didn't raise its drinking age? What if it stood to lose 30%? 4. Does the Court's ruling in the Affordable Care Act case suggest the Court will be closely scrutinizing large federal grant programs in the future? Note that SEVEN justices agreed that withholding federal funds from states that failed to expand their Medicaid coverage was outside of Congress's Spending Clause power.